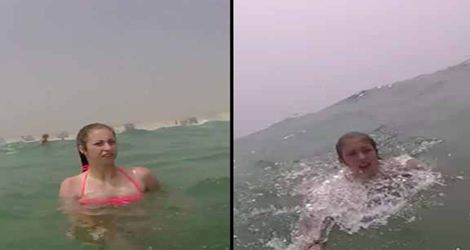 A girl who was nearly caught in a riptide and dragged out to sea was saved by hanging onto her selfie stick – and the whole terrifying experience was captured on her Go Pro. Texas teenager Erynn Johns and her family were on holiday at a beach in Nantucket. She was filming the impressive waves with her camera while swimming with her dad, Derrick. Then, suddenly, Erynn was hit by a riptide and unable to swim against it. Her mum, Jennifer, got caught up in the tide too when she attempted to help. The pair told the Boston Globe that Erynn held on to the selfie stick while her dad attempted to drag her back to shore and keep her above water. Erynn was able to hang on until she was rescued by a fellow holidaymaker, Tommy Vach. Her parents were eventually also saved by local lifeguards and Vach and received medical attention. Luckily everyone was okay. Who knew selfie sticks could save lives?